"O God Who Shaped Creation"
and lo! the dark was gone! 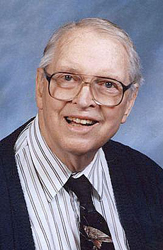 William Watkins Reid, Jr. (1923-2007), earned degrees from Oberlin College (1945, 1947) before graduating from Yale Divinity School and serving Congregational and United Methodist Churches in North Dakota and Pennsylvania. His service in World War II with the U.S. Army Medical Corps included time as a prisoner of war. The Rev. Reid was a Wilkes-Barre district superintendent in the former Wyoming Annual Conference (Pennsylvania) in 1978; and he held membership on various commissions and boards, including the Executive Committee of the Hymn Society in the United Sates and Canada. Many of his hymns are published in hymnals of several denominations. The Hymnal Revision Committee for The United Methodist Hymnal (1989) requested a hymn from the Rev. Reid that employed, according to the Rev. Carlton Young, "alternative metaphors and descriptions for Deity." The Rev. Young's evaluation of his contribution is high praise, "The poet's response may be his best contribution to contemporary USA hymnody." In five stanzas, the poet takes the singer through a variety of images of God: the Creator, in stanza one; an anguished mother in stanza two; the One who relentlessly searches for us in stanza three; the embracing mother who prepares a banquet in stanza four; and in the final stanza, a parent who "claim[s] us as your children" and bestows us "with freedom born of mercy." The Rev. Watkins' reveals his craft throughout the hymn. Each stanza contains phrases that potentially capture a singer's imagination. In stanza one, we move from "earth's chaotic dawn" to "lo! the dark was gone!" The stanza concludes with the imaginative phrase: "you blessed our infant footsteps and shared your splendored earth." The "infant footsteps" at the end of stanza one connect lyrically with the compassionate mother who cares for her child in the first line of stanza two. The hope and optimism of stanza one are starkly contrasted by "alluring, but defiled" ways of the world filled with "hate and lust." Connecting again with the child image in the final line of the first stanza, the poet laments that the "worlds you birthed and nurtured spurn the ways of peace." Stanza three employs the parable of the woman's search for the lost coin (Luke 15:8-10). Like the woman, God never ceases to search for us even through "earth's darksome maze." The stanza concludes that the joy that we experience when we stop running from God is analogous to the joy of the woman when she finds the lost coin. Stanza four connects the wandering of stanza three with our continual chasing after "trinkets" that "lose their charm." Still Christ waits for us with an "opened arm." The open arms of Christ are more fully realized in the following stanza when the author relates them to "mother-like compassion" with a "warm embrace." The Mother Christ prepares a banquet for us – a eucharistic image. The final stanza reveals a God of compassion that heals broken hearts. The hymn concludes with the image of children introduced at the end of stanza one. Our claim as a child of God "strip[s] our prideful shame" and bestows us with "freedom born of mercy." This hymn is a good example of how poetic skill may transform theological ideas into art. *© 1989 The United Methodist Publishing House (Administered by The Copyright Company, Nashville, Tenn.) All rights reserved. Used by permission.